The grant from one of Waterfront Properties and Club Communities’ premier developments will fund equipment purchases. 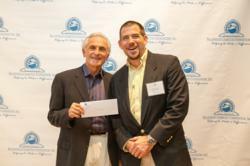 Ben Kovalsky, BallenIsles Charities Foundation board member, presents Owen O'Neill, executive director of Clinics Can Help, with a $5,000 grant to purchase oxygen concentrators. Waterfront Properties and Club Communities, which specializes in homes for sale in BallenIsles, is proud of the neighborhood’s foundation for supporting charities that make Palm Beach County a better and brighter place to live, work and play. Clinics Can Help, a Palm Beach County nonprofit organization that donates surplus medical supplies to children and adult patients in financial need, is proud to announce it is the recipient of a $5,000 grant from the BallenIsles Charitable Foundation. The grant will help Clinics Can Help provide respiratory equipment to clients with heart and lung disease. It is earmarked for the purchase of five oxygen concentrators. The BallenIsles Charities Foundation is the brainchild of residents who live in the community of Palm Beach Gardens homes for sale, and its mission is “Helping to Make a Difference.” Among the nonprofit organizations it supports are Allamanda Elementary School in North Palm Beach, near Harbour Isles; Alzheimer's Community Care; the city of Palm Beach Gardens’ 2014 BallenIsles Concert Series at Veteran’s Park, near Oaks East; Dwight D. Eisenhower Elementary School in Palm Beach Gardens, near Frenchman’s Reserve; Feeding South Florida; The First Tee of the Palm Beaches; Gratitude House; Kids and Police Tennis Association / Palm Beach County Sheriff’s Office Police Athletic League; Loggerhead Marinelife Center in Juno Beach, near Surfside Hills; Palm Beach Gardens Fire Rescue; Palm Beach Gardens High School; Palm Beach State College Foundation; Renaissance Learning Academy and Renaissance Learning Center, which are part of the Autism Project for Palm Beach County; Reaching Out to Cancer Kids; Scripps Florida Research Institute in Jupiter, near Abacoa; Symphonic Band of the Palm Beaches; The Arc of Palm Beach County; and West Palm Beach Waterfront Warriors. Owen O’Neill, a longtime nurse who constantly encountered patients unable to afford needed medical equipment and supplies, founded Clinics Can Help in 2005. Today, Clinics Can Help serves more than 1,200 clients annually and continues to grow – thanks to such support as that bestowed by the BallenIsles Charities Foundation. BallenIsles is a luxury development off PGA Boulevard in the heart of a vibrant city that has an abundance of amenities, including a variety of shopping opportunities, proximity to beaches and boating, pristine parks, recreational areas and open spaces, great restaurants, live music and theater, and convenience to nearby Interstate 95 and Florida’s Turnpike. The community also has amenities of its own, including a posh spa, a state-of-the-art fitness center, several themed clubs open to residents, wonderful dining, tree-lined bicycle paths and a handful of celebrity residents, including sisters Venus and Serena Williams, of professional-women’s-tennis fame. BallenIsles also serves as the site of social and charity events throughout the year and is renowned for its planning, decorating and catering. For additional information about BallenIsles, call a Waterfront Properties sales specialist at 561-746-7272. For additional information about Clinics Can Help, call O’Neill at 561-640-2995.